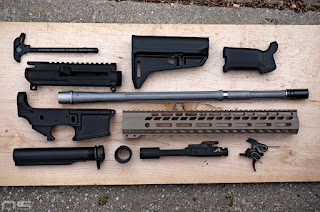 The very first thing that needs to be said about accuracy in 2019 is; we are living in a golden age of barrels and AR components in general. The quality to cost ratio might be as good as it's ever been so when someone takes offense to the notion that real precision can be achieved for a lot less money than that person might have spent, you have to remember that it's not just possible, it's not really very difficult. That's just the nature of technology and the advancement of our understanding of anything, whether it's firearms or vehicle engines or cell phones. It's also important to understand that the word "budget" is relative. My total for this rifle, including the optic, is $1100 in total parts costs (not necessarily what I spent, though I will provide that info as well). 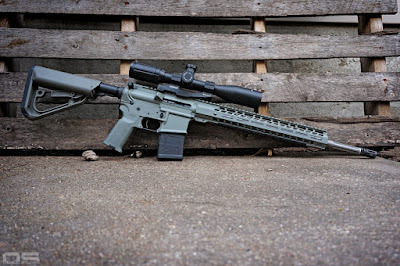 No doubt, it can be done for less and probably even as an off the shelf complete rifle, but the goal here wasn't to sort through a variety of rifles to discover which would shoot 1/2 MOA for the least amount of money. This project is for the builder who wants specific things and has tools, maybe trades and sells parts, and has spare parts lying around. In this case, I wanted a completely no frills rifle with a focus only on the parts important to the goal of accuracy. In my view those parts were the barrel as number one and the trigger as number two. Undoubtedly there are other ways to achieve total accuracy but they're going to increase the cost quite a bit. But this is just a 50 yard, 3 shot group. Not exciting. 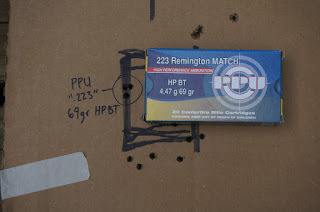 Up until yesterday, I could get one minute groups with this rifle shooting PPU match ammo at about fifty cents a round. It's pretty popular ammo in this space because it does shoot pretty well and at fifty cents, it's a good price for "match grade" ammo. 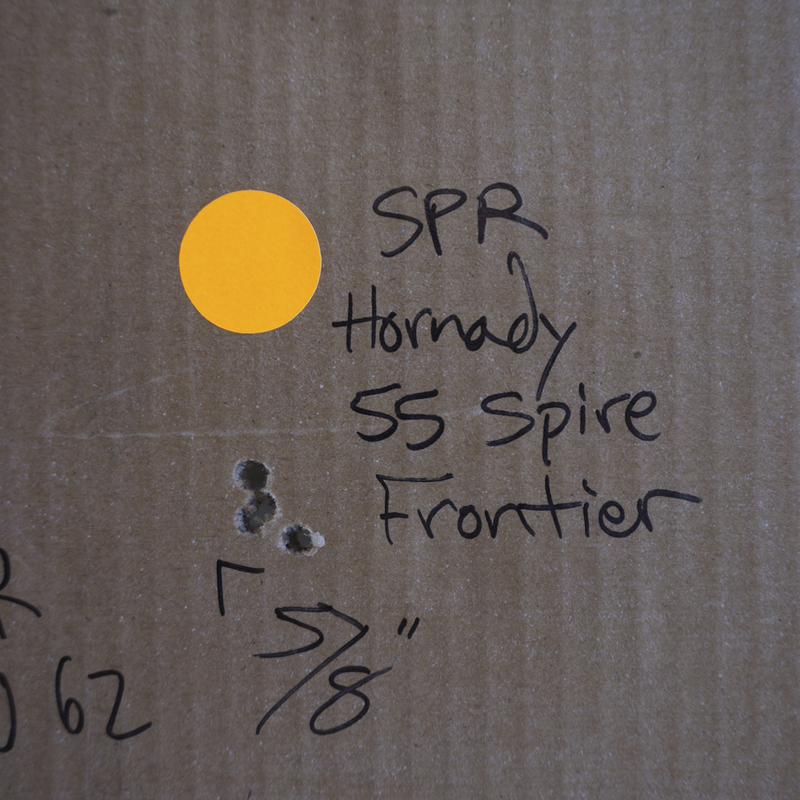 This post's title says no handloading, but one minute groups aren't special today even with factory ammo, so my precision rifle was really just a scope at this point. Not good enough. Could it be that a better barrel or some other expensive component was needed to achieve true precision? Enter Hornady. Hornady is an obvious choice when it comes to shooting tight groups but I thought the Frontier line was supposed to be "affordable" ammo, and therefore my automatic mental bias translates "affordable" as overpriced ammo that doesn't really shoot any better than anything else. Sorry Hornady, but when it comes to anything labeled affordable that actually costs more than truly affordable options, I am the world's biggest skeptic. And it looks like I was totally off base and just plain wrong in that assumption. More testing is going to be coming because of these spectacular initial results but at something like forty cents a round, this stuff is absolutely amazing. I'll soon be posting more groups with more loads from the massive Frontier line but for now all I have is the 55gr Spire Point. 5 shots, 100 yards, this IS exciting. Keep in mind this is a FIVE shot group at 100 yards, from prone with a front and rear bag. It measures 9/16ths of an inch, center to center. I am far from a spectacular benchrest shooter. When I lay behind the scope my heart beat causes the reticle to bounce and I seem to never be able to break the shot at the bottom of a breath. It's just not the kind of shooting that trips my trigger, bad pun intended. I get impatient and I never feel totally relaxed or confident. My list of excuses is longer than anyone else's. However, I feel that this means there is a certain percentage that can be removed from any group I fire from any gun. In my mind, that's true of anyone. I'm saying, I don't think it is possible for me to prevent the barrel from moving enough to put holes any closer together than this. I was able to keep the reticle inside the one inch circle while I was shooting but all that means is the best I can hope for is shots within that one inch. It doesn't really mean the gun wouldn't just shoot all five bullets into the same hole if it were held in a machine. But what it does seem to indicate, with me as the shooter, in a practical shooting position, is this gun will reliably shoot this ammo very well by anyone's standards. 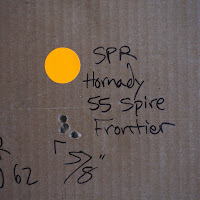 What it absolutely indicates is the need for lots more shooting of Hornady's Frontier ammunition. You may have noticed that the parts pile at the top and the finished rifle aren't identical. The Strike Industries charging handle went to another gun and so did the Magpul Stock. I have plenty of mil-spec charging handles laying around and what I have found is that the Strike Industries latch for $9 is all I need. It goes on every rifle I assemble as a necessity. The Aero bolt went into a different gun. Things get switched around, you know how it is. Based on reviews and forum chatter, I chose the Green Mountain Rifle barrel for this project. I don't feel there is any ballistic advantage to an 18" barrel and I usually try to steer people away from them if they think they are going to gain any meaningful velocity. 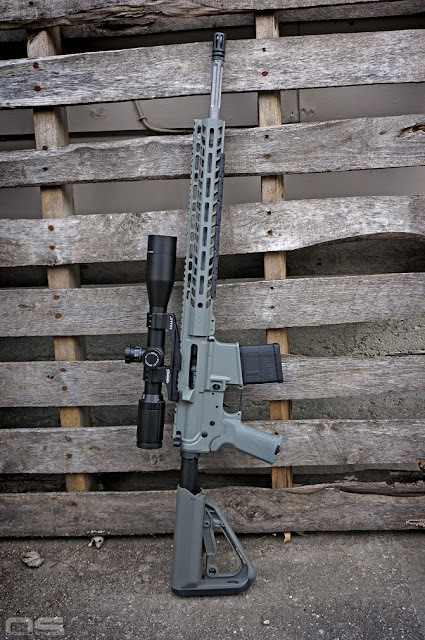 However, 18 inches does get you a rifle length gas system and sometimes (and by sometimes I mean, this time) they are on sale for less than the 16" equivalent. And that matters. 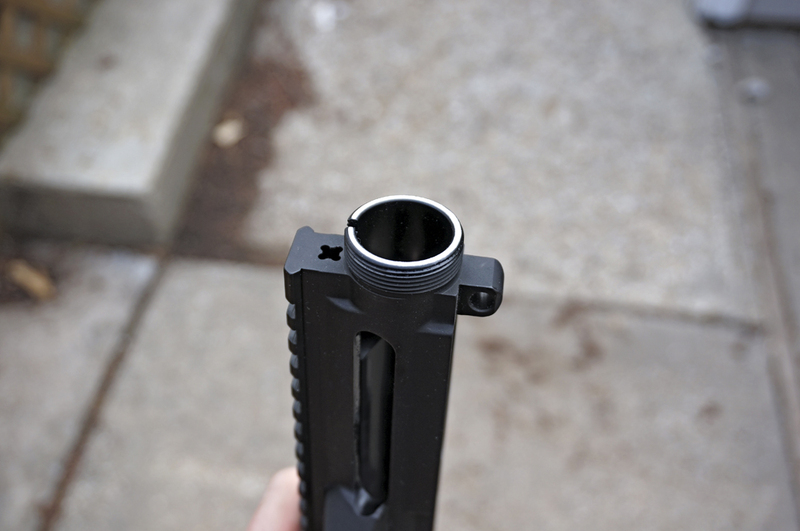 I partnered it with a gas block from SlipStream Precision because it had a nice finish that matched the barrel. The A2 flash hider came out of the parts box but I'd like to have a blasted finished one for matchy-matchy reasons. The trigger and entire lower parts kit is from Del-Ton. At the time I just wanted an improved trigger without spending a fortune. Either I did a poor job of researching, or there weren't a lot of options but at the time it seemed that most of these traditional, 2-stage triggers were pretty much the same so I just got the one that was a good deal. I forget who makes this trigger but it's sold as an enhanced LPK by Del-Ton. Today, I would have went with the LaRue MBT-2S trigger for it. Why you ask? They are extremely similar in design and function. Well, this trigger has a sluggish reset. In fact, out of the box it would stick and not reset at all sometimes. All I had to do to remedy it was polish the snot out of the disconnector and it is working 100%. In the end though, the reset feel is not great. Is that important? Not really. It's not for shooting splits. I think it could be further improved as well. My last grasp for precision was to lap the receiver. This inexpensive, and kinda roughly finished receiver was actually pretty much spot on square but I have the tool and it will probably be standard operating procedure for all AR projects so there it is. Take it or leave it. $101 Receivers. AR Stoner Upper and Anderson Ghost lower ($48/53). $125 BCG. Aero. It now has a PSA which probably cost more like $80. $185 Barrel. Green Mountain Rifle. 18" fluted stainless 1:8 Wylde. $30 Gas Block. SlipStream Precision. $9 Strike Latch. A Mil-Spec charging handle is probably $15. $115 LPK w/2-stage trigger. Del-Ton. $40 Buffer tube kit PSA. I think I had all this stuff so this is just what it costs from PSA. $20 Magpul K2 grip. I'm sure I paid less than that. $300 SWFA 10x fixed power optic. $1118 total give or take. All of these numbers are what I paid shipped or what the thing costs listed today. There is a transfer fee to add and by the time you pay hazmat shipping on spray paint I spent $50 on Duracoat Aerosol for the paint job (which probably cut a 1/16th off the group size I'm sure). I also got the scope mount free from SWFA when I purchased a different scope from them. So there it is. I'm not gonna say it's conclusive just yet, but we're verging on half-minute accuracy from a very affordable rifle, using very affordable off the shelf ammunition. Hopefully, I will have much more testing done soon.